Home / Unlabelled / THE MEANING OF " INNA LILLAHI WA INNA ILAYHI RAAJI'OON"
Yeah, sure we say this statement when someone dies.Also some of us may say this sentence when they lose something, suffer a setback or harm. But………..do you know what it means? 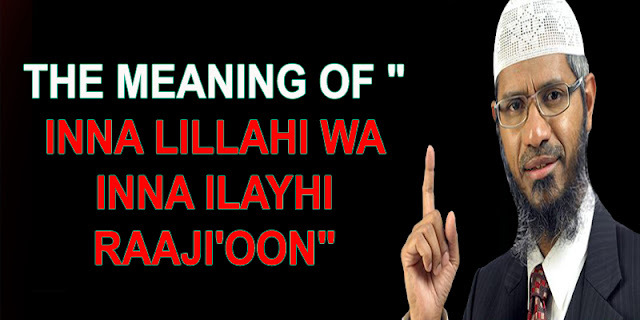 I mean ….do you REALLY, TRULY understand these words and their implications in a Muslim's life? Take a look around you; everything you see, all that you have and all that there is….in you, on you, around you….belongs to Allah, alone. It is Allah Who has given you all the property and goods you possess, and that He is the true Owner of them all. The kids that He blessed you with, the health that He gave you, the time that He has allowed you are all Allah's property. Even the bodies we live in and the life that we have belongs to Allah alone. The very souls that we think of as our "self", our "nafs", our "being" -- whatever you want to call it -- that very thing that distinguishes you from the rest of the world, belongs to Allah It's not YOURS. 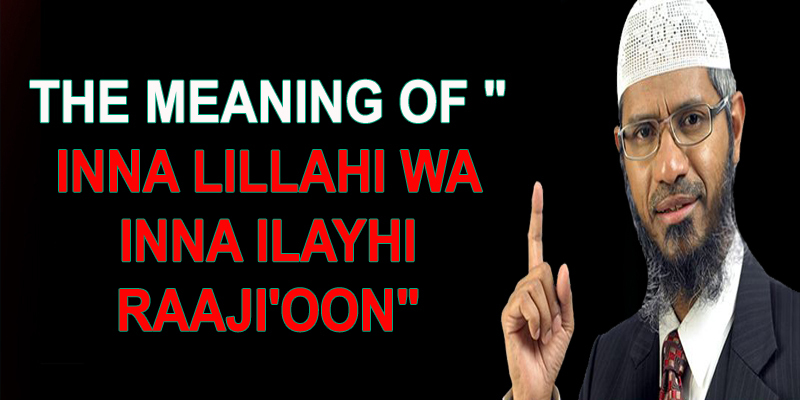 And this is the essence of the concept of slavery to Allah in Islam. And since He is the true Possessor of everything, and everything is His property, He gives what He wills to whomever He wills…And then He takes it away. After all, it was Allah's to begin with. So He may give you some thing and then take it back after a while.. He will bless you with a precious child that you love dearly…and then He may take it away. He will grant you money, honour and status…..and then He may take it away. He will give you youth, vitality and health and then surely He will take it away. In fact everything you have will only be with you for a very short while. And then the Owner will claim His Right. So when Allah does reclaim what was rightfully His, WHY MOURN OUR LOSSES? Just like a friend who lends you his book. And then after a few days, he wants it back and you give it back to him…no regrets…..no sorrow….no questions asked. Submit to the will of Allah, being pleased with His decision for you. For surely He will only do what is best for you. Just think…..The Owner came and took it back. Remember….that you're not the real owner…..you were NEVER the real owner to begin with. You only had everything because it was Allah who gave it to you in the first place. If He didn't give it to you, you wouldn't have had it in any way…in fact, you couldn't have had it. Remember….man enters into this world empty handed…and leaves it empty handed. Remember….that everything we have, all the blessings we enjoy, are gifts from Almighty Allah....gifts that we enjoy for a limited period until He takes them away whenever He deems fit. They are a trust from Allah…a loan to you…to see how you respond to these gifts from Allah and how you use them….in the obedience of the Almighty, thanking Him and worshipping Him……OR……...to the disobedience to the One Who gave them to you in the first place. And such Iman in the statement "Inna lillaahi wa inna ilayhi Raaji'oon"! She truly understood its meaning and the affect it should have on her life as a Muslimah, submitting to Him and being pleased with whatever He has decreed for her. She knew that whatever she has, is not truly hers. Rather, it is Allah's….and He took back whatever He owns at its appointed time. And it is because of this Iman so strong, this understanding, that the Prophet (Sal Allaahu Alaiyhi wa Sallam) made dua for them and Allah blessed them immensely.